The new construction condo market in San Diego currently offers 4 distinct buildings that are being offered for sale. Two buildings, Pacific Gate (Waterfront District) and The Park (Bankers Hill) are completed and ready for occupancy. Two additional buildings, Savina (Little Italy District) and 41 West (Bankers Hill) are in process of being completed and will be ready for occupancy by late Spring 2019. Below we offer information and available inventory for new construction condos in San Diego. 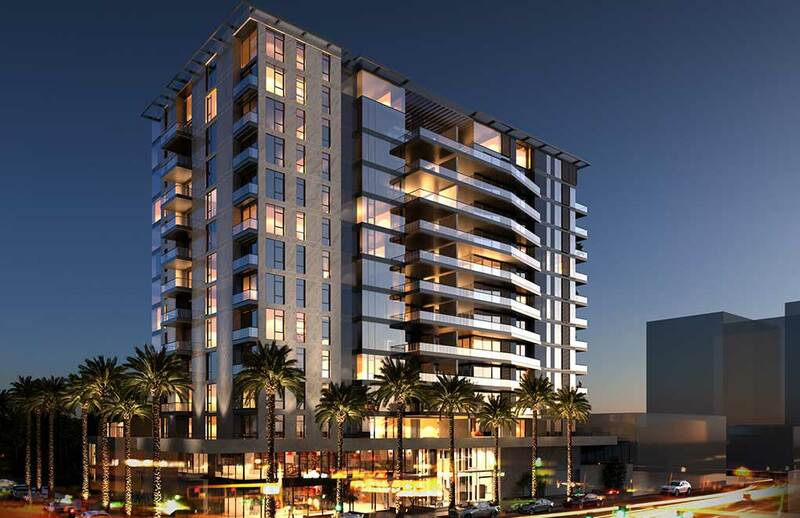 BOSA one of San Diego’s premier developers is currently selling two buildings, Savina and Pacific Gate. It has also presented plans for several new projects to break ground within the next 5 years. Below is a quick snapshot of each downtown San Diego new construction condo project that has been approved. Please click on any project for additional information, timelines, floor plans, additional rendering and more. If you have any questions please don’t hesitate to contact us anytime. As downtown San Diego Real Estate experts our goal is to offer you the most relevant and up to date information related to downtown San Diego new construction condominiums. Once completed this luxury high rise condo building by BOSA will be one of the premier addresses in all of Downtown San Diego. With 41 floors and 215 luxury condo residences this waterfront tower will feature upscale finishes, full service amenities and a premier waterfront location. Estimated to begin construction in late 2014 with delivery of units by Spring 2018. Prices will start around $1,000,000 for 2 bedroom condos. Savina Condos by BOSA (formerly known as Kettner and Ash) will be another luxury high rise by BOSA located in the highly sought after Columbia (waterfront) District right at the edge with Little Italy District and blocks to the great restaurants and services in India Street. This condo complex will feature 35 floor with 285 condo residences. There will also be retail space on ground level to add to the mix of services in the area. This project has broken ground in December 2015 and is scheduled to be completed by late Spring 2019. Pricing starts around $750,000 for 2 bedroom residences. The Park is currently under construction and will include 63 luxury condos and town homes in a 13 floor tower right across from world renown Balboa Park. Construction began mid 2015 and was completed by late Summer 2018. Prices start at around $1,000,000. This tower is projected to be 45 stories, 490 feet high with 296 condo residences. The bottom floor would include 15,130 square feet of retail space. The design would be very similar to the sister tower, Pacific Gate, and the same design firm will be in charge of this project. No start or completion date has been announced yet, nor have pricing, floor plans or any additional information released at this time. First and Island will be another high rise development by renown developer BOSA Development Corp. This project is scheduled to be a 38 floor luxury high rise with 172 condo residences. Retails spaces will be added to ground level to add to the mix of services in the area. This complex will be developed in one of the last remaining empty lots in the Marina District currently used as a parking lot. No start or completion date have been set yet and no floor plans or pricing have been released yet. Below is the current active inventory listed for sale for all new construction buildings in San Diego. Listings on our page are updated every 10 minutes with new listings and up to date information. Please note that some buildings might have additional inventory available that is not listed on the open market. Please contact us if we can assist you in finding any specific type of new construction condo in San Diego.